Having a referee for a game really opens up a lot of opportunities especially in respect to increasing the Fog of War. I decided not to let Iannick or Nicolas know anything aside from their own OB. They were blinded to the terrain as well as the other's OB. The following emails were sent to each player, one week before the encounter. Take your 2 brigades to the village of Gefrees, there slow the advance of Marshall Junot’s Corps. They will be coming from the east. Prevent them from crossing the river that runs through the village. Secure the bridge crossing over the river. We also have reports that King Jerome of Westphalia is advancing from northwest with a large force. Your specific orders are to Have your Brunswickers defend the northwestern approach to the village and send the Austrians to west to slow the French. It is critical that you secure the bridge as without it the French cannot bring their supply and artillery train over the river. Local reports tell us that the river is fordable by troops on foot. Approach the village from the northeast in march column. Please report back with your dispositions by next Saturday, noon. I require your specific brigade orders as well as their order of march into the village. Take your 2 brigades east to the village of Gefrees, there secure the bridge crossing over the river. It is essential as it is the only route for our artillery and supply train east. Local reports suggest that the river is fordable by troops on foot. 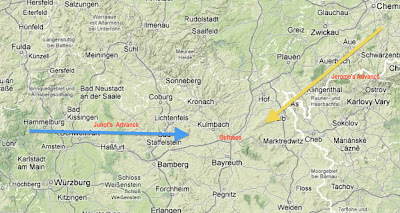 We understand advance elements of the Austrian IX Corps are in the vicinity.Once the bridge is secured advance to the northeast to join with the Army of Westphalia. Approach the village from the southeast in march column. Please report back with your dispositions by next Saturday, noon. I require your specific brigade orders as well as their order of march into the village. I took the Victory Conditions from the scenario in the magazine. Essentially each player received 1 point for each stand they had on the far side of the river, minus 1 point for each stand lost at the end of the game. 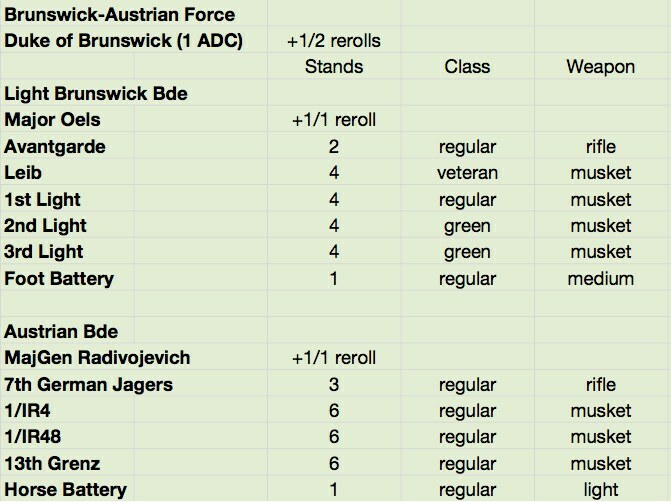 Additionally the Brunswick-Austrian force lost 5 points for each Brunswick unit that left their start point in the northeast corner of the terrain (they were forgiven the first 3 units), while the French received 5 points for each intact (in good order) unit that they could march off the board to join King Jerome from the northeast corner of the terrain. Each player placed one brigade in their starting corners before the actual terrain was placed. Their second brigades entered on turn 2. We started our game around 1pm, I expected it to go to around 6-8 turns max, I had played it out twice myself and was concerned that the French had a considerable advantage, even with less troops. Both times I played it they won a considerable victory, both times in 6-7 turns. Well what do they say about the best laid plans! We will follow the battle with some photos. Village of Gefrees: Northeast corner is lower left and southwest corner is upper right. We used a 6x4' terrain. The general tactical situation about 1/3 of the way into the game. The Austrians are on the bridge, really unopposed. They are supported by the Hungarians. The Grenzers are in line ready to meet a French assault across the river, as is the Austrian horse artillery. The Brunswick artillery have been advanced leaving 4 battalions of Brunswickers to protect against the advance of the Wesphalians from the northeast. The Brunswick avantgarde and Austrian jaegers have occupied the farm yard to the left of the bridge, this is the only hard cover in the game. Two battalions of French legére are advancing towards the river. The French line brigade are advancing towards the bridge. Well the game ran 13-14 turns when I called it quits due to time, clearly both Iannick and Nicolas were quite a bit more cautious then myself. The two times I ran the scenario, I had lost more then half the troops on each side in less then 6 turns. In this game I believe both players had at least 80% of their troops left in twice as many turns. It was however a clear victory for Iannick, he had lost few troops, essentially prevented the French from crossing the river in any force and defended the entry into the village from the northeast of King Jerome's Westphalians. As we are in a process of testing new rulesets to play Napoleonics, I asked each player to send me their impression of the ruleset and the scenario. First from Nicolas.
" After a full week of meditation since we played the battle of Gefrees, I have come to two quite diverging conclusions. One addresses the scenario, the other the ruleset. First of all, I found the scenario to be one of the best we had so far. The simulation of the fog of war by placing the river in one direction before we deploy our forces, and then replacing it in a perpendicular axis once we had deploy, made a truly great impression of discovering an unknown area while on the move to the point of confrontation. Added the fact that other terrain features where installed after the river had been reoriented made really a great effect of surprise, that completely minored the initial deployment of our armies. Both of our armies consisted of two brigades, and I felt really comfortable with the fact that a first brigade would deploy before the game start and the second after the first turn. It was really a good looking game and the fact that I took almost 10 pictures each turn on John's camera says it all I think. So generally speaking I really enjoyed the Game Design of this battle, and I am sure it made it a very interesting encounter. Yet, I haven't been so convinced by the Game Play. Although, I found the pace of the game very smooth and easy to follow. I can't help feeling that this ruleset is a little shallow. Of course, as Iannick said once, It is hard to enjoy at first a rule that doesn't give you a victory. None the less, being a player that is more after the historical atmosphere in a game rather than its actual outcome, I felt a little disappointed. To make it short, it sums up in two points. First, I found the rule a little too simplistic to give a good feeling of the period, and a little too generous in several situations, that we, generally speaking, found quite odd: the guns, the bridge, the fortified farm... More over, what, in the end, disturbed me the most, was a strange feeling of a complete lack of a sense of scale, that made some situation quite difficult to evaluate. It is somewhat hard to describe, but I can't seem to find a conclusive adequacy between the scale of movement, the scale of push backs after melee, the rate of casualties, and the number of turns we played. Also, I still perceive a game that doesn't deal with the effect of accumulating disruption on a unit, to be not really fitting the experience of wargaming at the tactical scale. Especially in the age of the black powder. To conclude, I found the scenario great and I would love to play it again... but with an other ruleset, since some lack of consistency in this one, made it a game probably better fitting the expectation of a player new to the universe of historical wargames." "I liked the firing a lot. Both from artillery and muskets. I like to play a Napoleonic game where a good placed volley can cripple an enemy battalion once in a while. I'm really annoyed when battalions can take volleys after volleys and just stand there (one of my biggest beef with BP). This also diminishes the number of melees in a game; I don't enjoy the "Warhammer" effect where everyone is stuck in melee for a couple of turn and the game just grind to a halt. I did not like the melee as much; the system is simple enough and that's good but almost all melees we played were finished after one "round" with one unit retreating. So the bigger unit often cannot bring it's numbers into play and with a little luck the attacker can win a very easy victory with largely inferior numbers (as we saw on the bridge). I don't hate it though, I'm just saying I find the mechanism ends up being more elegant at firing than melee. As for the scenario, I quite liked it and thought it was a really nice looking game. Playing the Austro-Brunswick was a nice bonus, and I'm always in my element when I have to defend. The scenario offered a lot of possibilities, as was obviously shown by Nicolas unorthodox strategy. I would like to replay it one of those days because I think you would get a completely different game. It was one of the more balanced scenario we tried. It showed also that you can have a great game on a 6x4 table with less than a division per side." So in conclusion it seems both players liked the scenario, but maybe less so the ruleset. Well what do I think? Well I did enjoy the scenario, I did find it a lot of fun when I played it. I think it would have been quite difficult for Nicolas to move the bulk of his troops over the bridge in a time effective way as was his strategy, but he eventually did get over. But by then almost twice the time had passed as I had allotted for the game. I did not set a turn limit for the game beforehand and this was a mistake. Maybe with this, Nicolas would have considered bringing the bulk of his troops across the river (as I had when I played the scenario), unfortunately bridge scenarios are always difficult as I have learned from previous play. In respect to the ruleset, I have a very positive opinion of them. 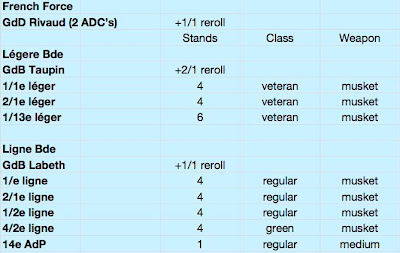 Really the mechanisms are quite simple and combat can be resolved very quickly without reference to even the QRS. I had a pretty good handle on the rules for the game, aside from missing a rule about the inability of skirmishers to block advance of formed troops. I believe they do represent the advantages of different formations that are important in Napoleonic warfare. Maybe some additional nuances in unit quality would have been nice. We did not really get a chance to test the Command and Control aspects of the ruleset as I would have liked, but really with just 2 brigades per side this was going to be unlikely. I think both Iannick's and Nico's opinion of them was coloured by the fact that most combat in the game was of a melee type rather then gunfire. I believe that melee was rarely the case during the Napoleonic era. 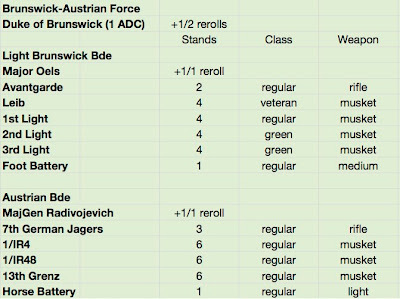 Most battles were fought initially with preliminary cannon bombardment (Nico never unlimbered his cannon, and Iannick got his Austrian Horse artillery in action quickly but was a little slow in getting the Brunswick artillery into play), followed by musket fire. In this ruleset both are lethal, which I like. The other thing I like about the rules is that frontage is everything, get your troops in the correct position and the rules will work to your advantage. Anyway we still seek the Holy Grail of Napoleonic Wargaming. I put together the following list of what is important to me, and I suspect when all is done we will be revisiting these rules. Only time will tell. Rules has to have easily remembered mechanisms, we game Napoleonics every one to 2 months, I am not really keen to re-learn a rule set each time. Up next, I believe is a test of Shako II. Great looking pictures here, with some beautiful figures (I do like the French ones! )...A great bridge AAR! Great AAR, a lovely looking game. Excellent Battle Report! Thanks to all three of you for providing such a great assessment of both the rules and the scenario (one that I'm going to have to try). I look forward to hearing the group's opinion of Shako II. Great looking game, for sure, and a terrific collection of figures. Great Battle Report John! I was look forward to it, and I am really pleased. The pictures are great. Very evocative. We might not have the ruleset yet, but at least we have a perfect frame for future AAR. An excellent looking game. I've never played Rank & File rules, so I can't really comment. The scenario did look good though. We used to use Shako years ago, I didn't even know there was a Shako 2?? Fine looking game, and is seems that both players were challenged by the scenario, and enjoyed playing the game. What's not to like there? I have to say... seeing those massive blocks of troops clash near the bridge... that is the visual greatness of Napoleonics! Just would not have to wanted to be in that push for real! Very nice write-up and excellent pictures. Reminds me that I am in Montreal after all. I might join you guys for a game or 2 if that's convenient. A great looking game, beaut game report and review of a set of rules to boot; fabulous! We have tested quite a few sets of rules too. Sometimes you know a set is not for you, other times they are worth a second go. Sounds like these are in the latter category for you three. Great report and game, John! Great to see you guys getting to use your amazing collections. 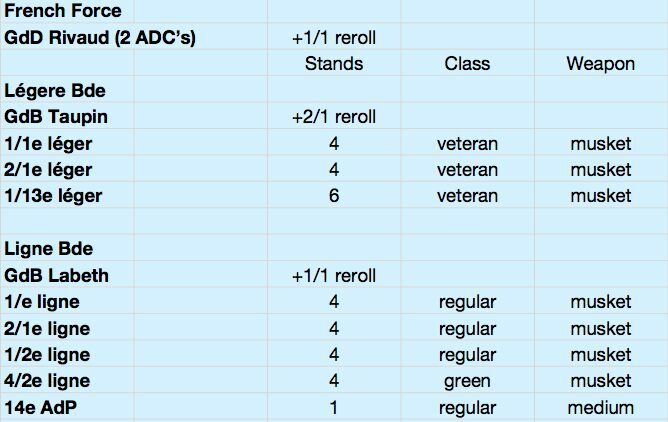 The one thing about trying new rule sets I found is that most of them take two or three games at least before the mechanisms and interrelationships between them really becomes evident, so unless they are clearly not everyone's cup of tea, giving the rules another shot may not be such a bad idea. Looking forward to your next AAR!